Those who make a splash in the sports world often receive recognition and fame. Although you’ll likely face challenges along the way, it isn’t hard to find an inspirational story about a college athlete. Of course, getting into the big leagues isn’t easy. Physical performance is only part of the battle. There’s also plenty of competition to contend with. If you want to win, you need to be efficient and know your target. Our student athlete resume templates help you in both of those areas. They motivate coaches to draft up the latest talent while it’s still available. So go ahead and get your name out there. Prepare to show the world what you’re made of. Why Use Student Athlete Resume Templates? College life is rigorous. Back-to-back classes, hours of daily conditioning, and assignments that take you into the wee hours of the morning don’t leave you with a lot of extra time. Our student athlete resume templates enable you to turn out a professional-looking document in a matter of minutes. What’s your skill level in the following areas? Don’t worry – you won’t need to know anything about the abovementioned topics to make your resume look and read great. Our student athlete resume templates will do all of that for you. Want to build a document that turns heads? 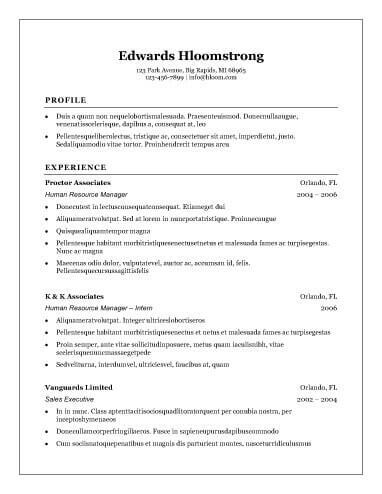 Try out our popular resume templates. Our editors chose these designs to help you develop a job-winning document as quickly and easily as possible. Right away, you'll notice an attractive style that comes from clever combinations of fonts and layout elements. These samples are fitting for a variety of experience levels and career stages. No one knows exactly who is going read a resume you submit. Therefore, when you’re not sure which of the student athlete resume templates will generate interest, go with what’s tried and true. This layout pulls from traditional elements while ensuring a current style. It’s pleasing to the eyes thanks to creating the right balance between heading and body text formatting. Many universities hold tight to long-standing traditions, so it’s no wonder this style is so attractive for admissions staff. Rather than employing sleek fonts and eye-catching styles, it exudes elegance and tidiness. This layout follows a chronological format. It fits everything to one page without looking cluttered. It’s just one of our more than 400 document templates. Scouts and recruiters see no shortage of candidate applications. Make it easy on them by using our simple and clean student athlete resume templates. Far from boring, this layout will likely go over well at Ivy League, state, and other private universities. Although the resume is minimalist, you still have the power to change colors, fonts, and bullet styles. If you’re an incoming or current freshman, you’re at the beginning of an exciting academic journey. The entry-level format is a great choice from among our student athlete resume templates. Its design calls attention to the many skills you’ve already developed without looking empty because of a short or nonexistent work history. Besides, being "entry level" only happens once. Our resume examples give you a good idea of what to include in your document. However, you may still be at a loss. How can you use your resume to its greatest potential? Here are a few tips. Only use a professional-sounding email address in your resume. If you’re planning to be away for a while, consider setting up an email autoresponder. You don’t have to list your physical address. At a minimum, though, include your city and state. Make it as easy to call you as possible by separating the groups of digits that comprise your phone number with dashes or periods. Don’t include overly personal information, such as your date of birth, social security number, or nationality. The purpose of the summary section is to provide a short "elevator pitch" to recipients. Keep it brief. Take advantage of this section to point out your top abilities, accomplishments, and strengths. Include a few of your soft skills and personality traits to round out the summary. Although you’re writing a short biography, don’t use the words as "I" or "me." Avoid all pronouns, so don't refer to yourself in the third person, either. In this section, sentence fragments are okay. While you tabulate your skills, compare the terms you use to those you see in actual job ads. By making such adjustments, your resume is more likely to pass an applicant tracking system. An ATS is often used to filter out applicants by the terms they use in the skills section. List both hard and soft skills. For example, a baseball pitcher may include active listening along with curveballs, fastballs, and sliders. You may have picked up additional skills while working other jobs, such as running a point of sale system. Only include skills that are relevant to the type of positions you’re applying for. If you speak another language, list it in this section, along with your fluency level. It’s best to organize this section chronologically. List your most recent or current job at the top. Don’t include details such as your supervisor’s name, exact location, or pay. Be careful about overusing words. Use a thesaurus whenever you need inspiration. Only use abbreviations if they’re commonly known. If you’re in doubt, spell it out. A good physical education can create a link to a successful career or business venture. Did you know that several persons who later became billionaires played sports in college? Solid resumes oftentimes open doors. For those who possess little professional experience, they can be especially challenging to develop. Our student athlete resume templates and builder tools help you in several ways. For one, they take the mystery out of writing a powerful summary statement. Customization ensures that your piece will stand out among the rest. Finally, our resume builder produces a document that’s compatible with the most commonly used computer programs.